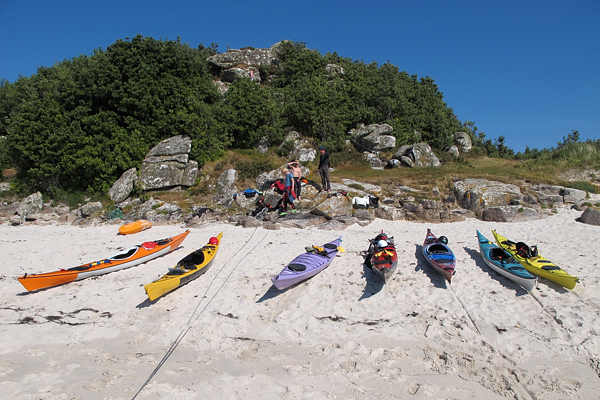 At the beginning of June we went with other members of Tower Hamlets Canoe Club to the Scilly Isles. We went to this place two years ago as seakayaking beginners with Simon Osborne from seakayaking Cornwall and got hooked. It was interesting to come back in a role of more experienced paddler and the possibility to enjoy not only the isles further afield but the varied conditions, too. Here are some videos of the trip. Here we are adding a report written by Alistair. One cool Tuesday evening in February at the Prospect of Whitby as we were warming up over a pint of fine Ale, Ailien mentioned that she would like to cross from Lands’ End to the Scilly Isles in the summer (an open sea crossing over 50km) and make a holiday of it too. This caught the imagination of some of us who very quickly got thinking about how, where and when. Great ideas, a holiday with white sandy beaches, clear blue water (in England!) AND an added prospect of a greater challenge of the sort that none of us had yet encountered. But let’s park that idea for a while. Ailien opened the trip to less experienced sea or WW kayakers on the club forum with the view to introducing others to a taste of the sea, island hopping and wild rocky coastlines. We soon had a confirmed group of 7 paddlers – Ailien, Michal, Natalie, Kieran, Tordi, Julian and me. We arrived in Sennen Cove near Lands’ End at about 3.30am in time for a few hours kip on the roadside next to the car. At 7am we stirred with some polite exchange with a local man probably on his way to work and probably wondering why on earth we chose his driveway. We took a short walk out to the headland to feel the wind on our faces and make our final decision on how we would get to the islands only to find a 4 maybe even 5 southwesterly winds – nice wind but wrong direction. After agreeing how wise we were to have bought ferry tickets in advance we quickly visited the spot Michal had less wisely diced with death some 5 years earlier while lead climbing off the sea cliffs of Sennen Cove. It was a scary story to hear while peering over those very cliffs, I quietly wondered, and hoped that Sennen would not haunt us with disaster this time, as this is exactly where we intend to land a week later after our return crossing. Hmmm, is there a lesson hidden somewhere here? Now it was time to meet the other three who by this time were exploring Penzance having arrived a couple of hours earlier (sometime after 5am). We met up easily enough and after a wholesome but greasy breakfast at a local diner (recommended by the chap with the driveway), we had parked our cars, loaded our bags and boats, and were queuing to board the Sillonian III. Our adventure was underway. We all surfaced at around 8 and slapped together a quick and meaningful breakfast under M&N’s light weight shelter. The weather had turned slightly overcast with a north-westerly 4 (gusting 5). The sea state was a moderate 3 with wind waves approx. 1m. We headed off in a clockwise direction from Thomas Porth where our boats had spent the night and before we knew it we had passed Crow Rock and the northern most point and were heading in a SE direction (when some of us insisted that we had to still be heading NE). Lesson: Have own map on boat always. After some re-scaling of our brains to the size of the small islands and satisfactorily confirming and all agreeing our current location we continued towards Old Town Bay where we stopped for some lunch and a wonder around the old church yard and village. Once the hilarity had subsided we were on our way again across St Mary’s Sound towards The Gugh and St Agnes. The sea state was picking up at this point and Kieran was doing very well in what must have been some unknown territory for him – an ‘open crossing’ into a stiff breeze and on bumpy water. With the wind on our front starboard side and gentle tide moving SE we ferry glided across the sound, past the bell buoy cardinal and then allowing the wind to blow us south towards Hoe Point. We enjoyed some gentle playing in the rocks and moving water before the sheltered water of the Cove between the two islands. Before stopping for a beer at the Turk’s Head we played in some waves. Interestingly we paddled over a sand bar that had small breaking waves coming at us from both sides (north and south) and meeting in the middle – sadly not quite big enough to do much with. After a quick Guinness we were on our way back to St Mary’s. The fog had settled, St Mary’s had vanished from view and we were in a beautiful eerie light heading on a NE bearing towards Bartholomew Buoy which we could only just distinguish in the fog. Lesson: Always take compass. Before too long we were navigating the rocky shore of the Garrison with some slightly more daring rock hopping attempts before landing back at the Mermaid where we would store our boats for the night. After a generous swig of the essential Madera’s stash of Highland Park single malt and some communal campsite cuisine, we closed the day in style. My brother’s 40th birthday and our relocation from the Garrison to Fraggle Rock on Bryher. I had realized that I had too much stuff to fit into my boat, Mistake No2. I now had to find a way to stash surplus kit at the Garrison for the next 4/5 days; luckily the campsite was up to the task. We were knocking on the door of midday before we had our boats packed and our shopping done. My camera was nowhere to be seen and all I could do was leave a message to the bar staff at the Mermaid to keep an eye out for it for when we return on Friday. We had a gentle slightly choppy crossing towards the Tresco Flats which I’m told are only half a metre deep at spring lows. During the lowest springs of the year there is apparently a mad wading race along the sand bars linking the main islands, perhaps this would be a good excuse for our next Scilly visit. After setting up camp some of us (Michal, Tordi, Julian and I) decided the day’s paddle was not over, we needed a little more. We headed north from Kitchen Porth (the bay near Fraggle Rock) past the mighty Cromwell Castle towards Shipman Head, a notorious headland facing the Atlantic. On approaching the danger point we all agreed that we were up for it and took a wide berth around the headland into some big sea. The swell was 3-4m beneath us as it approached the shallows and the wind from the north-west was a steady 5 pushing us towards the rocks. The sea birds were all over the place, I swear I saw a Puffin fly straight past me and belly flop with a distinct lack of any kind of grace into the water in front of my boat. Do they do this? It was hard work making our way past the mouth of the aptly named Hell Bay towards the shelter of Scilly Rock, keeping my empty bobbing super lightweight Reval pointing in the right direction and making the necessary progress – the wind was treating me a bit like a weather balloon which lead me to exchange a few expletives with the Gods. Lesson: Load the nose and lift the skeg… next time I shall know better!! A following swell dampened by Scilly Rock lead us neatly towards the Black Rocks and the generally rocky seascape of SW Bryher, a sea-kayaking playground. It was getting late and our earlier plan of including Sampson in our afternoon jaunt had evaporated at the thought of a good wholesome meal back at camp. On arrival Ailien was well progressed into the preparations of the culinary delights that were to follow. It is impressive what combining ingredients and adding some creative thought and unexpected spices can create. An astonishing spicy mixed seafood medley, WOW, there were smiles all around – certainly my tastiest campsite meal ever. A gentle start to the day saw us finally meet some friends of the Madera’s (Nick and Ali) who just happened to be visiting their in-laws on the Scillies while we were there. Poor planning meant that they only had to wait an hour and a half (!) for us in their rented plastic double, but that didn’t seem to dampen their spirits at all. The weather was fine and sunny with calm water between the islands. The wind was a steady 4 north-westerly. We avoided disturbing the birds on St Helens, so we landed on Tean for lunch and paid a quick visit to the recently uncovered ruins of St Theona’s chapel (is it just me or are these islands watched over by mostly female saints?). Tordi, Michal and I split from the group for a short diversion around Tean and met the others at the Eastern Isles in the company of lively wildlife; we saw Seals, Razor Bills, Gannets, other Gull type birds but sadly no Puffins. It was glorious. Michal and I decided it would be fun to try to roll the barge, Nick and Ali’s nice dry, very wide double kayak. Thankfully we managed this although not without completely drenching their nicely padded and dry interior for their trip back to St Mary’s. Lesson: Choose your rolling partner with care… Michal only just got away with it. Progress was slow as we headed into the wind back to Bryher. Julian and I spiced it up with a bit of racing and general skulduggery until we saw some tasty rock and surf on Yellow Ledge off the aptly named Bathinghouse Porth. This was my Mistake No. 3, time to play, or so I thought. After successfully surfing through the gap between the rocks, and seeing Michal do it after me on a bigger wave I thought yes that looks like fun, let me wait for a ‘bigger wave’. So as I waited, using a half baked knife draw to try to keep myself in position aligned with the gap in the rocks I saw the big wave coming in and went for it not realizing that the angle of approach was no longer favourable and getting worse by the millisecond. Indecision and lack of boat control took me straight into the obstacle that I was trying to avoid. Then crash! Bang! Ouch! Alastair caught out yet again by a big exposed rock. Lesson: Think then act! I felt the crunch of the carbon fibre before my head hit the rocks (and yes I was wearing a helmet). Lesson: If you have a helmet, wear it. Rolling would not have achieved very much as only my head was under water (balanced on a rock) at this stage. Ailien later reported seeing the nose of the carbon kevlar Reval bent 90deg around the rock. Lesson: Beginners should stick to plastic! The rescue: Michal and Ailien were thankfully nearby and ready to help. Ailien clipped on to my boat and dragged the listing vessel (front compartment completely flooded) to shore while Michal ordered me onto his back deck. After realizing the difficulties in turning with me on the back hanging on like a monkey he enlisted the help of Natalie who by now had joined us to assist. Natalie hooked to the front of Michal’s boat and pulled his nose to face the shore and we started making progress to land. The extra pressure on Natalie’s footplate caused it to fail so we had a series of repairs mounting up. On arrival both boats were taken up to camp ICU. Michal promptly resolved the footrest issue on Natalie’s bumblebee with some fiberglass repair before dinner and I thought I had better wait until first light before assessing the damage and making a start on the battered Reval … soon to be named ‘Holy Grounder’. Today our group split into three. MN&T went north around Tresco to look for rocks to play in. J&A went on a ‘Zen’ calm water paddle around Samson accompanied by Red Mullet and Kelp with some shallow water husky towing for added fun on their way back. Kieran very kindly sacrificed his morning on the water and offered to assist me in my quest to get my boat fixed. My plan was to take it to the experts at the boat yard which was fortunately a mere 200m away towards Anneka’s Quay. Maybe they would get it looking like new in two days, and who knows, maybe they could even get me going again on something temporary, like a plastic something or other. Wishful thinking Ferrar! Lesson: Other people have lives too. Of course they were otherwise occupied; rushing to fix other boats and could not fit me in until the weekend. Also, all the spare kayaks were funny sit-on-top things at £30/day. Nah, time to instigate plan B. I managed to purchase a couple of large fiberglass repair kits from the boatyard, plus a good amount of sandpaper. Kieran and I spent much of the morning sanding the inner front hull to get the key needed for the glass-fibre to adhere. We left the Reval sitting in the sun to fully dry out while Ailien ferried me across the harbour to Tresco to do some shopping for supplies and join the others visiting the glorious Tresco Abbey Gardens in the afternoon. The gardens are magnificent and filled with exotic plants from the antipodal sub-tropics, something for Tordi (Oz), Julian (Kiwi) and me (Saffa) to get nostalgic about. I did not think it possible for a garden like that to exist in the open air anywhere on the British Isles. What a glorious afternoon. Ailien took the short ferry hop back across to Bryher while the rest of us paddled the boats back for another round of Ailien’s well-choreographed campsite dinners. Most of the evening I had my head stuck into the awkwardly small front hatch getting awfully frustrated with the distinct lack of co-operation that I was getting from the combination of resin and fibre. The fumes kept me calm enough to prevent me from smashing the entire boat to pieces and Kieran very patiently and understandingly stood by for assistance. Had I bitten off more than I could chew? Lesson: Always stay calm when fibre-glassing! …and wear your worst clothes. Tonight was movie night on Bryher (something about the ghosts of Samson Island, or so I was told) at the village hall, but I stayed at camp to finish repairs and get to grips with the sticky situation I had managed to get myself into. The foghorn kept me (and I’m sure most of us) awake for a fair chunk of the night, odd because there was no fog to speak of. But a small price to pay for paradise. I had renewed confidence that my boat was now seaworthy and it was time to put her to the test. I bravely agreed to join the group heading north into the bigger waves at which point we realized that the big waves weren’t very big today and we would all take that route to St Martin. The swell was moderate up to 2m with a fresh breeze starting to swing more to the north, not a good sign for those intent on doing the crossing in a couple of days’ time. 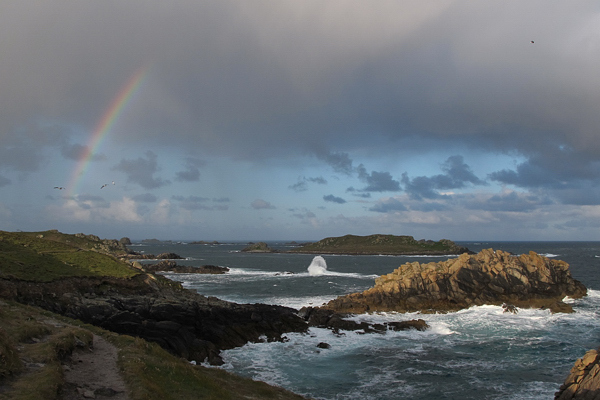 The bird life north of Tresco and St Helens is impressive, but sadly no Puffins. Before landing at Lower Town I happened to pass by a yacht named ‘Holy Grounder’ which was snapped on Kieran’s camera, only to become what my boat is named from this day on. We explored St Martins that afternoon from Lower Town to Middle Town to Higher Town and on to the vineyards in the east where I bought the most expensive lousy tasting wine ever (my sentimental side got the better of me). We now had to rush back to rescue my and Tordi’s boats from beneath the high water line -thankfully Tordi had got there before me and saved my already damaged ego from yet further damage. Lesson: Always stow boats above high water before a land based adventure! Quick breakfast, decommission the camp and then pack the boats with everything for our trip back to St Mary’s via St Agnus. I thought it would be fun to head north around Shipman Head and down the west side of Bryher to fully test my boat while loaded, so after Ailien and Kieran took a look over the headland we were good to go as a group of seven around the bad side of Bryher. The weather was fine and clear with a gentle north to north-easterly breeze (yes it had now swung to the wrong direction just in time for the crossing). As we were heading out I was thinking that if my boat makes it to St Agnes without any water in the front compartment I would consider doing the crossing with Michal, so lets wait and see. With the boat well loaded I was not afraid to hit the waves hard and sink the nose as much as possible. I did however stay well clear of the rocks (see earlier lessons). The trip to St Agnes was easy with some tidal assistance, a tail wind and Kieran’s improved technique we were there before we knew it. After checking the front compartment, which was bone dry, I approached Michal about the possibility of joining him on the crossing. I sensed reluctance from him at first so I was still not sure if I would go. He mentioned that Natalie was also considering it – so this was the moment of reckoning. During lunch we discussed the main issues (i.e. the wind, the swell and the hour of departure) and Ailien and Tordi decided that the combination of issues was not favourable and it would not be much fun, so they opted out. Natalie mentioned that if I would go then she would not, as she would be satisfied that Michal had company. This is when I decided that I would do it, in the Reval, the Holy Grounder, my patchwork quilt of a boat. Michal and I would sleep tonight on the beach next to packed boats to wake up at 2am for a 2.30 departure. Please let this not be Mistake No. 4! And please Sennen, welcome us home. After a short amble for coffee and ice cream we were on our way again back to St Mary’s around the south of St Agnes, a rock gardening paradise. I stayed well away from all hard objects while watching the sea birds and the others having a jolly time… I was not in the business of learning any more lessons at this stage. We landed on St Mary’s and Michal and I swiftly went off to find a place to camp for the night to be ready for our early morning departure. We were hoping the Queen’s visit to St Mary’s earlier that day would not have alerted the Scilly security forces to unusual activities on beaches. We found a spot just the other side of the Lifeboat Station on a little beach called Porth Mellon under what we would discover as being the only streetlight in Hugh Town to be illuminated all night! We spread our wet stuff out to dry, got dressed, left our boats and kit, did some final shopping and joined the others at the camp site. I thought it was worth popping my head in to the Mermaid to see if they had happened to stumble across my camera and guess what, they had… it was all coming together quite nicely. Lesson: Never write off a small town pub. I then joined the others in the restaurant for our farewell meal, which mostly involved punching chart data into our Garmins. 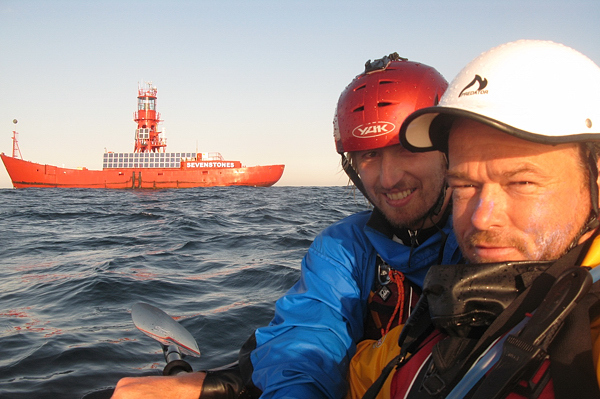 We were making good headway and reached St Martins Head in less than an hour and kept going on Michal’s bearing of 75deg towards the Seven Stones light ship. The wind was north easterly, a gentle force 3 against us which we could handle with the assistance of the tide, averaging nearly 4 knots we were slowly clawing back the time. We got into a steady rhythm watching the sunrise bang on our nose, as if nature had set our bearing. Eventually after some hours we knew we had reached Seven Stones and could see the light ship in the distance. The sea was rising up over the submerged shelf creating a fascinating seascape of hills and valleys very different to the sea we had been experiencing earlier that morning. We had to be very careful and kept a lookout for anything that looked steep or threatening. We guessed that the light ship was an hour away and we would refuel our tanks once we got there. The light ship was a bizarre sight when we finally got to it. A large abandoned floating vessel with a massive lighthouse rising from its middle. Like a giant noddy boat bobbing alone in the middle of the ocean with barely any land in sight. We did not hang about there for very long, after a quickly shared use of the pee bottle we were on our way again, leaving the light ship 20min behind schedule. This is when things started to change. It wasn’t very long before we noticed a distinct increase in the velocity of the headwind, we were clearly in a strong force four so it was time to put our heads down and push into it. We decided that we would not change our bearing much as this would happen naturally with the wind – if anything we pointed further north 65/70deg. We had to get as far north as we could before the tide turned against us to join the wind in our battle against the elements. We were slowing down significantly to less than 2knots, the tide had fully turned and the wind was now definitely a 5 and we had to keep pushing. A couple more hours passed and it did not feel like we had made much progress but we knew we had, thanks to technology. We were tiring but needed to keep moving. The towline resting on my front deck was creating a hollow which was collecting water as we crashed through every wave, slowly filling my cockpit with water, eventually I realized that we needed to stop and raft up in order for me to pump the water out and remove my towline. We got going again without taking on much food, (I must have unknowingly chucked my towline overboard rather than in to my cockpit during the last stop) we had to make our time back. Lesson: if it doesn’t float, put it in your boat. The headwind kept getting stronger like a constrictor snake steadily inching tighter around its pray. Why just as you least need it does nature turn on you like this? I felt so small in this big sea, fighting and fighting to achieve little more than keeping our ground. The wind was a strong 5 occasionally 6 and we were losing energy and I knew we had at least two more hours of this if we were ever going to make it, so I suggested to Michal that we stop for 2 minutes to take on some food. Even though my food was right there in my buoyancy aid jacket pocket, we still had to make a calculated judgment on whether or not we should stop paddling and loose valuable ground to the wind and tide. Eventually we had little choice but to stop and eat. It got better for me after this point I felt stronger, like I could keep going all day if needed in order to get there one inch at a time. I focused on the land bearing, a mast almost due north, and I put my head down and pushed and pushed and pushed. We were paddling north cancelling the wind only to be inching our way east with the tide. I was not going to give in and be swept back out to the Scillies, I was not going to call the coast guard, it was not an option, and we were going to make it to Sennen Cove, the bay that we had been staring at for the past couple of hours to our right. We saw the lifeboat head out and return a couple of times ahead of us wondering if it was us they were looking for, but I was almost comforted by the thought that others must surely be in more dire straits than us in this godforsaken sea. Two hours or so later we started to turn our noses more east and head more directly towards our destination, I knew now that we had made it – we were making twice the progress and the force of the wind was being noticeably moderated by the landform, it was now merely a matter of time before we coasted in to Sennen. What a relief to not have to keep paddling at full strength, to know that we had made it across the sea on our own against a relentless and tireless wind, after no sleep and with a taped up boat… we made it. The sea became very confused as we approached the Cove, the wind and tide was playing silly buggers, whirling it about. Neither one of us was in the mood for surf, or for any kind of games, we were exhausted all we were interested in was to stay upright to drift gently to shore. The Garmin registered 8 hours 59mins when we finally landed. I kissed the ground and could barely walk. The last 5 nautical miles must have taken us about 4 hours. My legs felt practically useless as I stumbled to get my camera to record the moment. Michal was just sitting in the waves not even bothering to try to walk anywhere, as if paying due homage to the evil and beautiful beast that is the sea. It took a huge amount of effort to lift ourselves up and carry our laden boats to the high water line to a place where we could just relax, lie back and take in the day’s events. After a well-earned fish n chips and a couple of beers we lay and kipped in the sun for an hour or two before loading the boats and kit up onto the causeway. I left Michal on the roadside and hitch hiked a ride back to Penzance to get my car. I returned a couple of hours later to find Michal dozing on the park bench where I left him on the roadside in his sleeping bag, beer in hand, surrounded with kayaks and kit, with not a worry in the world. 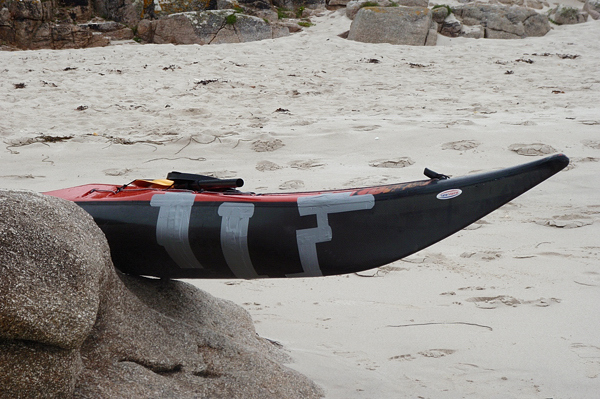 This entry was posted in Clips, Paddling, Salt water and tagged Scilly Isles, by Natalie. Bookmark the permalink.